Gold Coast Big Day Out 2012 Skateboarding. BIG DAY OUT is proud to announce the return of the Vert Ramp Skate Show to the national tour for 2012. Twenty years ago, skateboarders rolled in on a huge custom built vert ramp to the sounds of skate rock band “Village Idiots” (on what was to become known as the “Skate Stage”) marking the opening of the first ever BIG DAY OUT. The legendary BIG DAY OUT skate show had begun and ten years of amazing skaters, amazing ramps and truly amazing skateboarding displays were to follow. It’s been ten years since BIG DAY OUT has been able to do the skate tour as part of its regular shows and to celebrate 20 years of BDO, the skate show is back for 2012 and it’s bigger than ever! 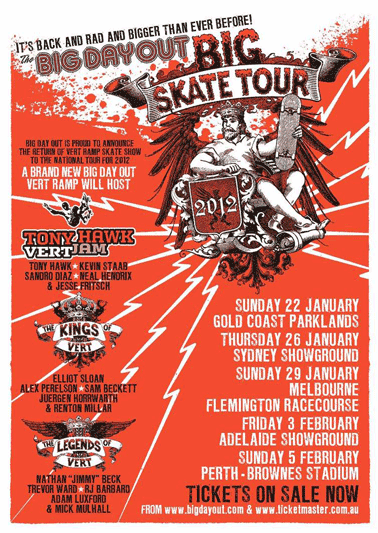 Kicking off in New Zealand and continuing across Australia in January and February 2012, BIG DAY OUT is stoked to be welcoming some of the world’s very best vert skaters on THE BIG SKATE TOUR! This is what I got from the Skateboarding Demos at the Gold Coast Big Day Out 2012. Skaters: Trevor Ward, Mick Mulhall, Keegan Palmer, Sam Beckett, Elliot Slone, Renton Millar, Juergen Horrwarth, Alex Perelson, Kevin Staab, Jesse Fritsch, Neal Hendrix, Sandro Dias and Tony Hawk all shredding the 14ft high, 40ft wide Vert Ramp on site at the Big Day Out.